Cocktail hour is not just a reason to drink, it is a whole process. I love the rituals associated with cocktails. 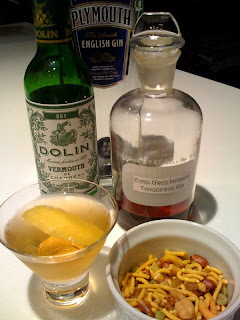 A martini stirred with a proper cocktail stirrer, made with Plymouth gin, a splash of Earl Grey Tea infused Tanqueray gin, and Dolin Vermouth with a twist of lemon peel. And because cocktail hour is not complete without some nibbles, I love English Bombay Mix - a spicy blend of nuts, mild and spicy crispy noodles, pulses, sweet dried fruits.